A Yahoo bulletin board created in late 2005 by activists associated with a former Hamas-support network laid the groundwork for creating a replacement virulently anti-Israel group, an amended complaint filed in Chicago federal court on March 29 alleges. The new complaint bolsters several allegations made in a 2017 lawsuit that the American Muslims for Palestine (AMP) and several of its activists are "alter egos and/or successors" of the Islamic Association for Palestine (IAP) and the American Muslim Society (AMS).Those were two names for one organization that was found liable for an American teen's 1996 death in a terrorist attack. The bulletin board was referred as a "transition" to a new organization, the complaint says. Among its organizers were Hatem Bazian and Magdi Odeh. Odeh had helped coordinate IAP's first annual "Jerusalem Festival for English Speakers" held in Chicago in 1999. Bazian, chairman of AMP's national board, was a featured speaker at several IAP events and shared a close personal relationship with IAP/AMS leader Rafeeq Jaber, listed as a defendant in the case. Jaber is a former IAP/AMS president and AMP's financial adviser. He has spoken at numerous AMP conventions and events. AMP routinely sponsors conferences that serve as a platform for Israel bashers and openly approves of "resistance" against the "Zionist state." It is also one of the principal advocates of the Boycott, Divestment, and Sanctions (BDS) movement against the Jewish state. IAP/AMS was the propaganda arm of a now-defunct network called the "Palestine Committee." It was created by the Muslim Brotherhood to help Hamas politically and financially in the United States. The court dismissed the earlier complaint against the AMP and its activists in August 2017 saying the plaintiffs "fail[ed] to demonstrate the requisite level of unity of interest and control" to support the alter ego claims. The new complaint seeks to overcome that shortcoming. Stanley and Joyce Boim were awarded $156 million in damages in 2004 after alleging the IAP and AMS were among groups liable for a 1996 Hamas terrorist attack in Israel that killed their 17-year-old son David. The IAP/AMS closed after that, citing "the burden of the Boim Judgment and associated litigation costs." Now the Boims want AMP to pay the outstanding damages, arguing it is comprised of the same people engaged in the same activities, just under different names. "At the end of 2005, after a short quiet period, a purportedly new organization emerged under a new name, 'American Muslims for Palestine, or AMP,' but with the same fundamental mission and purpose of IAP/AMS," the complaint states. AMP "ended up with largely the same core leadership as IAP/AMS; it serves the same function and purpose; it holds nearly identical conventions and events with many of the same roster of speakers; it operates a similar 'chapter' structure in similar geographic locations; it continues to espouse Hamas' ideology and political positions; and it continues to facilitate fundraising for groups that funnel money to Hamas," it adds. The "new name and quiet period were a necessity," the complaint says, because the defendants came under increased law enforcement scrutiny after the Boim judgment. They "recognized that these organizations could not continue to pursue their missions with the same names, in the same form, and saddled with the same civil and criminal liability as IAP/AMS. They therefore deliberately concealed their connection to IAP/AMS, emphasizing internally that 'we really need to distance ourselves from any well known IAP figures.'" In a January 2006 message published on the Yahoo bulletin board, Bazian suggests an upcoming Muslim American Society (MAS) convention in Milwaukee would be a place "to meet for AMP business." "In preparation for the meeting, specific care was taken to avoid any public connection to IAP/AMS," the complaint says. "For example, Magdi Odeh told the group that Sufian Nabhan, who was an IAP board member and its Michigan representative, should be left out 'when we meet in Milwaukee since he is well associated with IAP.... [W]e really need to distance ourselves from any well known IAP figures.... [s]ince this is the transition period....'"
Nabhan, however, helped establish AMP and served nearly 10 years on AMP's board, the complaint states. That 2006 MAS convention ended up being "an IAP reunion" and "a precursor of AMP leadership." A panel discussion featured future AMP director Osama Abuirshaid and future AMP President Hatem Bazian. AMS President Rafeeq Jaber served as moderator. 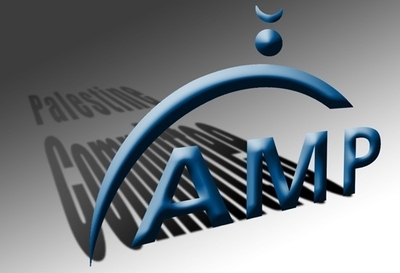 AMP conferences are similar to IAP's old meetings, and are sponsored by many of the same charitable organizations working for the Palestinian cause, such as Baitulmaal, Zakat Foundation, Islamic Relief and United Muslim Relief. "Each of these organizations has close connections with Hamas and disburses funds through Hamas operatives," the complaint alleges. IAP raised and funneled money to Hamas through the Holy Land Foundation for Relief and Development (HLF). In 2008, the charity and five top officials were convicted of funneling millions of dollars to Hamas. Bailtulamaal, Inc. is a member of the Union of Good, a charity sponsored by radical Egyptian cleric Sheikh Yusuf Qaradawi and tagged in 2008 by the U.S. Treasury as a Specially Designated Global Terrorist Group. The Gaza-based Unlimited Friends Association for Social Development (UFA) "is closely aligned with senior Hamas leaders" and "openly states that it channels funds from Baitulmaal to the 'families of martyrs of the Palestinian people,'" the complaint says. "Baitulmaal has openly distributed meat to Hamas functionaries and government workers on Muslim holy days claiming that "it is a matter of principle for the charity to help [Hamas] officials who can't afford to buy meat," it adds. AMP also provided material support to Hamas through its "open fundraising support" for the so-called "humanitarian convoy" Viva Palestina, the complaint says. In 2009, Viva Palestina activists headed by its founder and leader British Parliamentarian George Galloway met with Hamas leaders to provide "funds and equipment." Galloway personally "handed substantial sums of money and equipment directly to Hamas leader Ismail Haniyeh, stating, 'But I, now here, on behalf of myself...are giving three cars and $25,000 in cash to Prime Minister Ismail Haniyeh. Here is the money. This is not charity. This is politics." AMP National Policy Director Osama Abuirshaid and former President Abdelbasset Hamayel were "two of the essential managers and operators of IAP," a motion attached to the revised complaint says, who "were brought in to manage and operate AMP." Not only does it allege that "the board of directors and core leadership of IAP/AMS and AMP/AJP substantially overlap" but also "demonstrates that there were substantial intangible assets and good will transferred from AMS/IAP to AMP." "All of the followers, know-how and content went to AMP. For example, AMP's inaugural convention "which was held within months of AMP's formation, was attended by approximately 700 attendees and was a financial success," the motion adds.